Two new Desolation of Smaug TV spots! As fangirlish.com reports, Peter Jackson and co. have released TV spots No. 4 and 5 in anticipation of the second Hobbit movie, set to hit theaters on December 13th. Let’s take a look! This one features a lot of familiar imagery, with emphasis on themes brought out in Unexpected Journey and several shots shown in previous trailers. One thing that stands out is the bright-colored, overly active effects, which are certain to dazzle those who love the new-age 48 frames-per-second glow, yet frustrate traditionalists who are still clinging to the Lord of the Rings films. Here, the emphasis is more on Bilbo and his journey, but there are several moments that ought to excite Hobbit fans considerably. For one thing, it never gets old catching glimpses of the barrels — one of the novel’s most iconic scenes — and the Bilbo-Gandalf dynamic definitely connects well with the successful Gandalf-Frodo tropes in LOTR. My favorite shot? Pause the video at 12 seconds, as the boat travels by water through a quaint, sleepy, almost Scandinavian fishing-looking village. What attention to detail! Often, it’s the set and world creation where Jackson does his best work, and it looks like fans will get plenty of that to chew on. 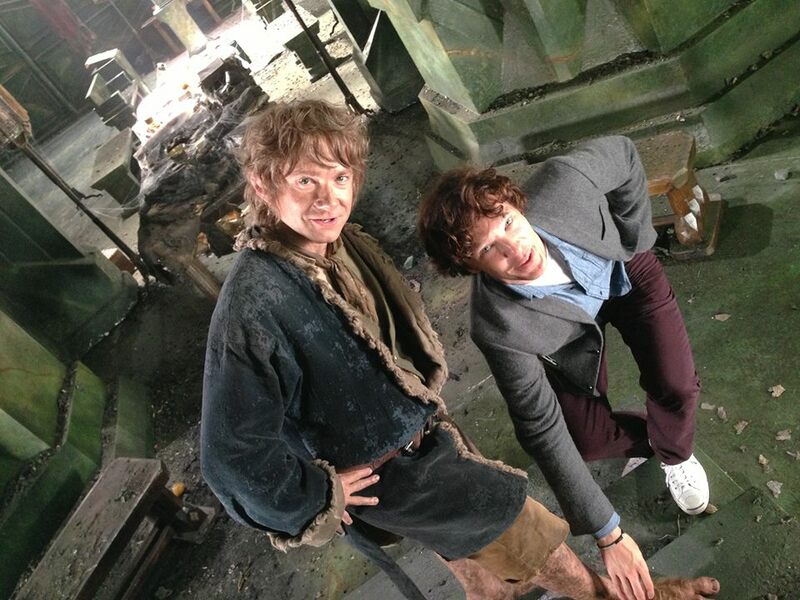 Less than two months to Desolation of Smaug! Who’s excited? Save the date! Peter Jackson announced on his Facebook page that on November 4th (5th for New Zealanders) a pretty exciting fan event will take place in London, New York, Los Angeles, and Wellington–complete with live appearances from the cast! Complete details can be found below. Hi everyone! Less than two months ’til we open “The Hobbit: The Desolation of Smaug” on December 13, and we’re in the midst of an intense post-production. However, we have got a pretty cool fan event planned for Monday, November 4, and I would like to invite you to join me and many members of the cast in a special live presentation. We’ll be appearing before live audiences in cities around the world, including London, New York, Los Angeles and, of course, here in Wellington – which, for Kiwi fans, is going to be Tuesday, November 5. This is how it’s going to work: the 4 host cinemas will all have members of the “Desolation of Smaug” cast on stage, and we’ll all be satellite-linked to allow everyone to participate in a simultaneous Q&A … as well as present a few special surprises. Additional cinemas will be set up in select locations worldwide where fans can gather and watch the events unfold live. If you can’t be there in person the event will also be streamed live on the internet. But for those that do show up in the cinemas… let’s just say that I’m going to have a special “thank you” from me for making that extra effort. Be sure to check the official Facebook and Twitter pages for details on locations, timing, and how to sign up for a chance to join us. We’re working around the clock at the moment, so I’m not going to get a lot of sleep between then and now, but I am looking forward to this. Hope to see you there! Today has marked the end of an era. 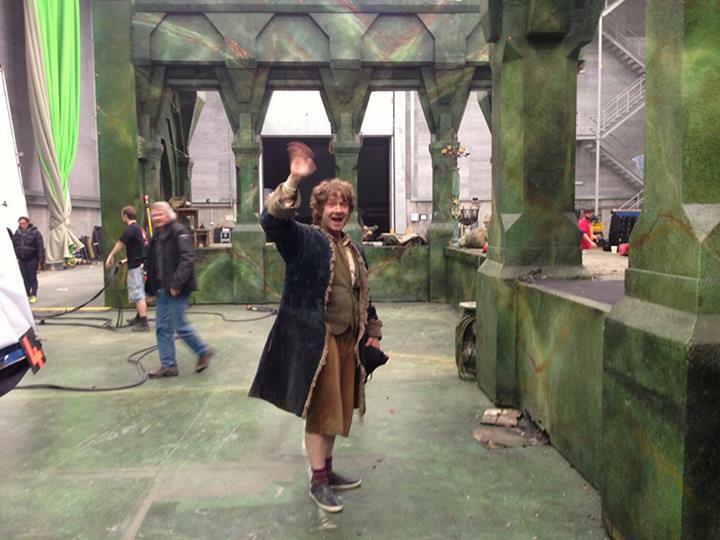 Our Gandalf (Ian Mekellen) finished his last scene on the Hobbit set today. 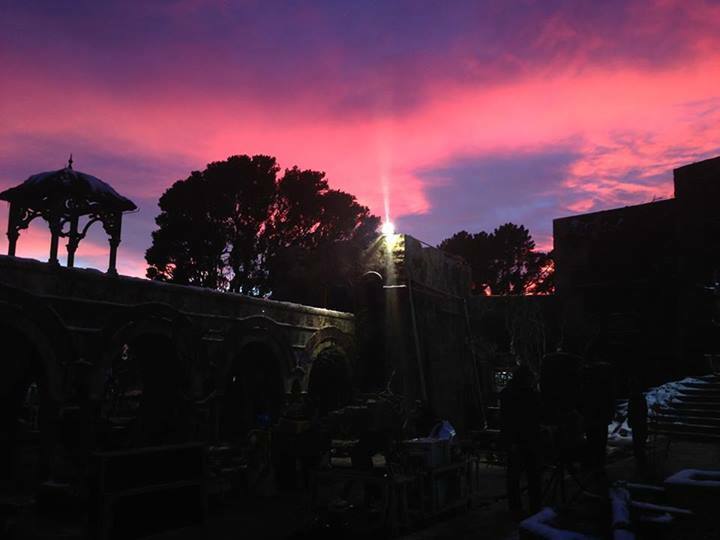 It was obviously a very emotional time for the cast and crew working on this trilogy, Especially Peter Jackson, who, soon after finishing Gandalf’s final shot, posted this picture and its caption on Facebook. Ah yes, Ian McKellen really is a legend. From the moment in 1999 he first took the role as Gandalf, there was never any doubt in his ability to portray one of the most powerful beings in Middle-Earth. We love you, Ian! Now matter how many movies you star in, you will forever be Gandalf! It’s a sad, sad day for those who were hoping to see some footage or the cast and director at this year’s San Diego Comic-Con, but unfortunately, not everything is premiered there, much to the delight of those not able to attend. 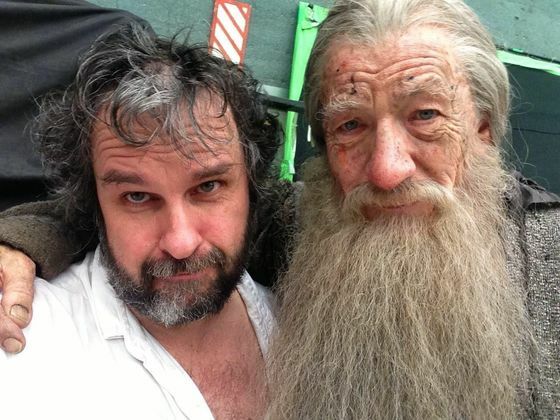 Right off the bat in this latest The Hobbit production video blog, Peter Jackson made the announcement that he, nor anyone else, will be able to go to Comic-Con this year and present any exclusive footage for attendees. This is unfortunate indeed, but it seems that Peter does have good reason to not be able to show anything, as they are still hard at work in New Zealand working on pick-ups, and he just won’t have the time to edit an exclusive video, fly all the way out to San Diego, stay for a day, and fly all the way back to New Zealand. Because of all the work needed to get done in time for the release of the 2nd movie, I can see why it is with a heavy heart that he can’t give us this. With that said, hopefully, he’ll be able to give us something for 2014’s Comic-Con. 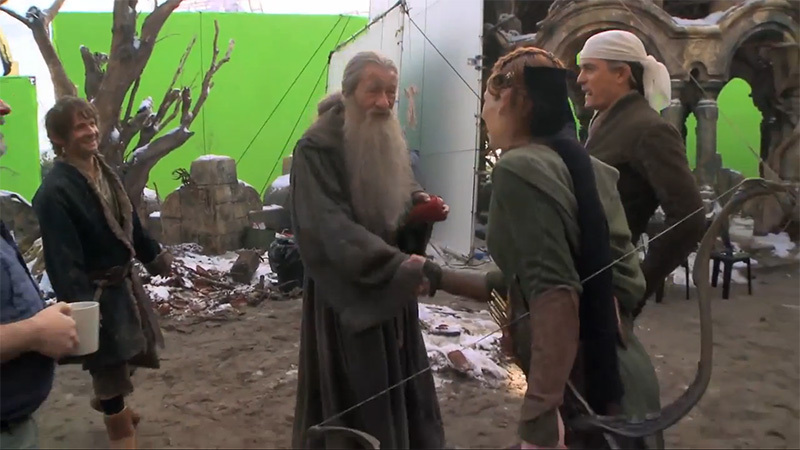 Now, watch the video below to whet your appetite, which shows you the return of certain well-known actors for their last time on the set, talk of the Battle of the Five Armies, Dwarvicise (you have to watch), Radagast poo, and Orlando Bloom on fake-horse-riding (you really have to watch). A day after saying goodbye to Gandalf and Tauriel, it was time to farewell Legolas. 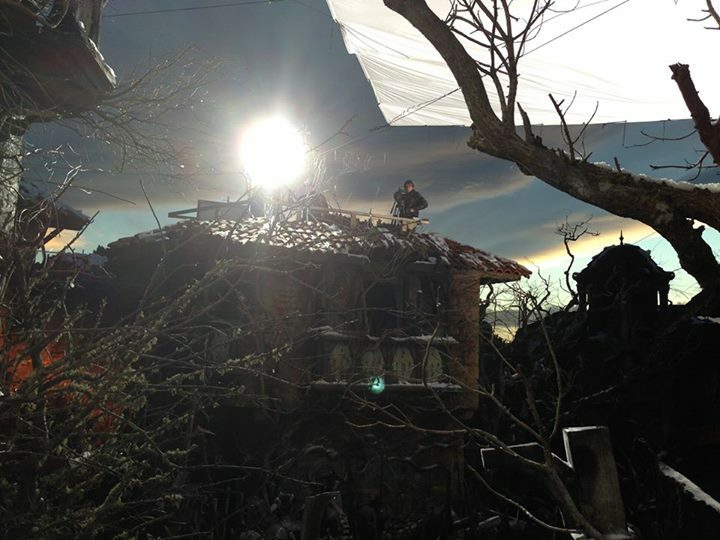 What a great day it was, with Orlando battling a serious Orc for all 12 hours of shooting – part of the Battle of the 5 Armies for the third Hobbit movie. When we finally got the day done, we said goodbye to Orlando, had a couple of beers … and couldn’t resist doing this! That is Orlando’s take on They Are Taking The Hobbits to Isengard, which you may remember from a few years back. If not, here it is!